For posts from around the world, visit the home of That's My World Tuesday. Wow. I love how the colors seem almost over-saturated in this shot. Nice shooting! Fantastic capture. It is nice to find the bird amidst the colors. Ah, look at that happy guy!! What a marvelous shot, Carver, as always! I can feel "spring" in this one! And isn't it wonderful!!! Have a great week! Surely he posed just for you.... and demanded a background colour of a suitable tone! So fantastic and romantic photo!!! I love the background of this photo. It's so spring-y. Spring has sprung in your world. Oh, that is glorious, plain and simple. Just gorgeous. O how beautiful! The little one looks happy and content amidst all that flowering colour! Great capture. What else do you need to get a spring feeling. I could almost hear its tune. What a great photo of the robin! Oh! This is just breath-taking! Wow! What a fabulous perspective and the light coming through that canopy of color is just pure magic! And...to top it off you have this amazingly beautiful bird in the photo too. I LOVE it! This robin looks rather thin, is it because of winter? 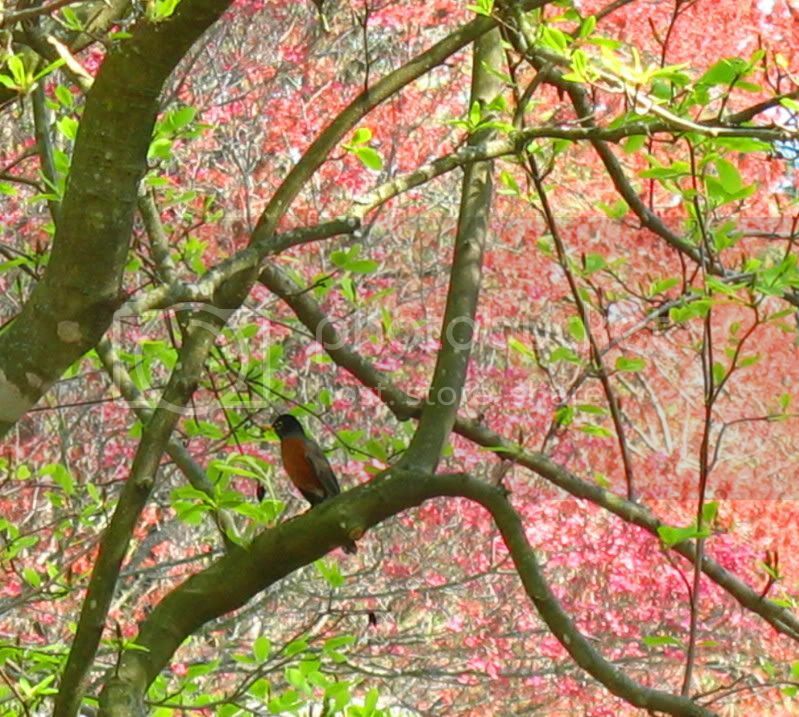 the robin is adorable, but the colors of the trees in the background - wow! so pretty! Oh, my, so colorful - spring is truly sprung. Gorgeous photo. It must be beautiful to sit under that lovely blossoming tree and listen to his song!